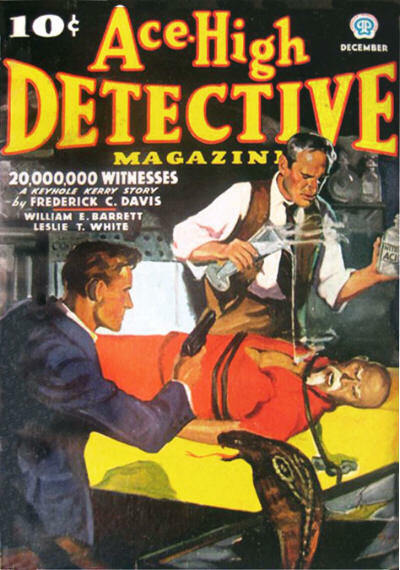 PULP COVER FRIDAY GOES ALL GUMSHOE! 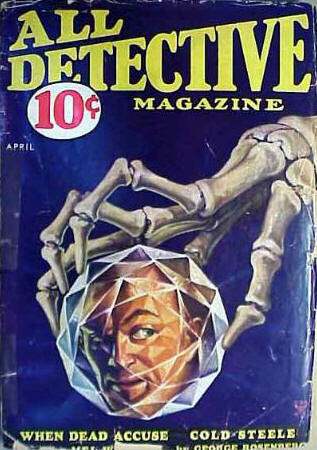 Though my major fictional interest is sf and fantasy, I’m also minoring in mystery. 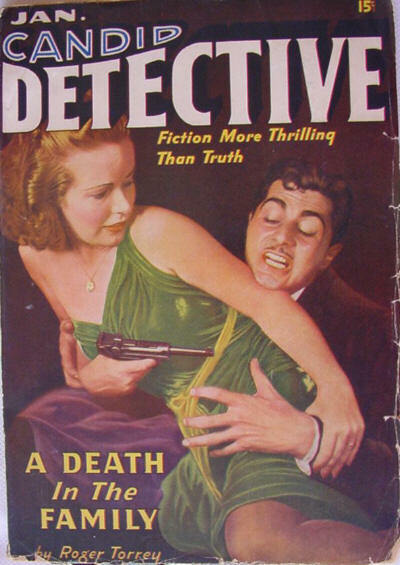 Basically, I’ve been spurred on by the constantly luscious buffet that is Ebay, so I’ve been picking up the odd mystery-crime-detective magazine here and there (Did you know that ELLERY QUEEN MYSTERY MAGAZINE alone has OVER 700 ISSUES??!!). 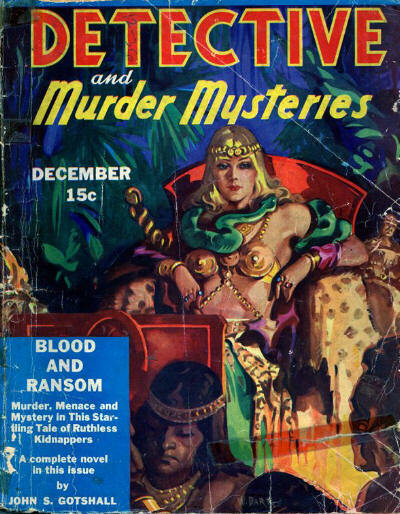 I don’t know a whole heck of a lot about the mystery-crime-detective field, so that I thought I’d go trolling the intertubes and see what I could find. 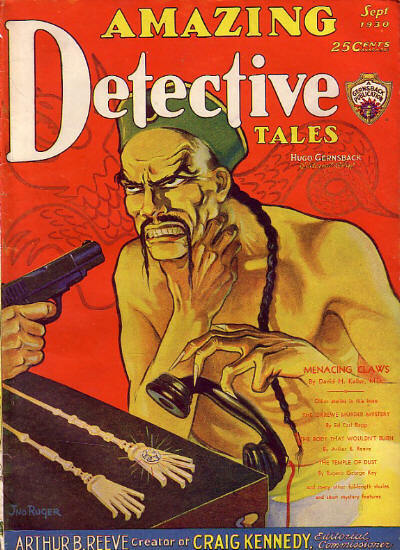 First up (alphabetically), this issue of ACE-HIGH DETECTIVE (12-36) caught my eye right away. What the heck? 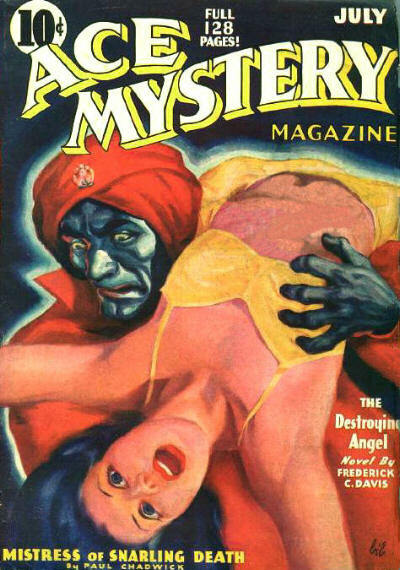 For your first essay, explain what is wrong with this cover. Give three examples. Here’s ACE MYSTERY (7-36). I may have used this one already, or maybe was thinking of using it. I don’t know. In any case, here it is or here it is again. 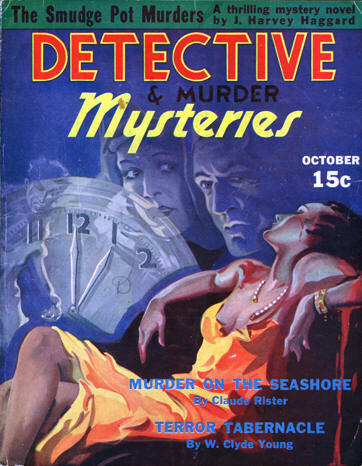 Here’s a couple from ALL DETECTIVE (4-34 & 1-35). 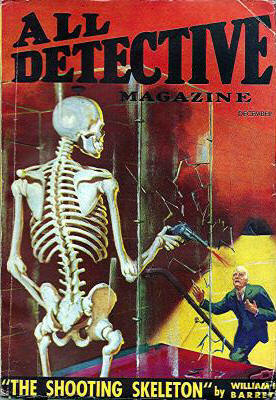 As you see, they seem to have a fondness for skeletons. Although this one (12-34) is one of the weirdest images I’ve ever seen. 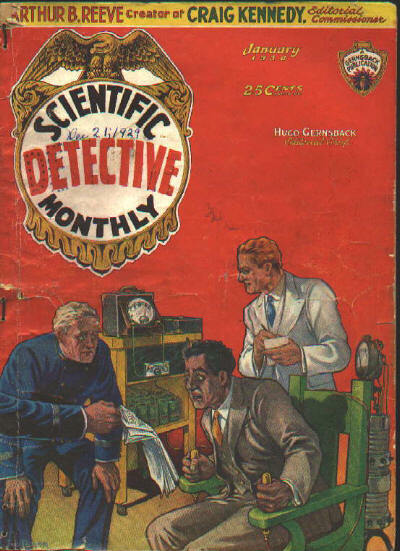 When it was sold off to another publisher, they became less gadget oriented (9-30). 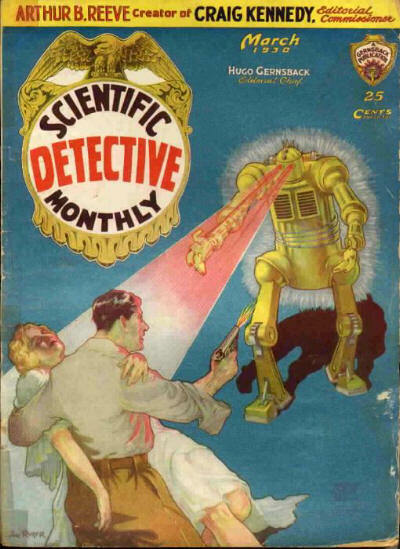 Here’s another one from the Gernsbackian era, which has maybe the only robot ever to appear on a (purported) mystery pulp cover. CLUES. 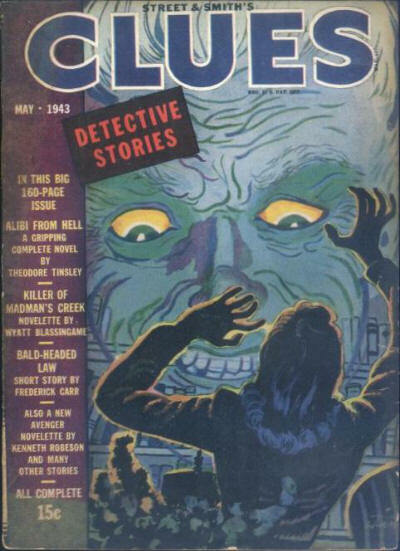 I was clueless, but this was one of the longest-running mystery pulps, with 218 issues published between 10-26 and 5-43. 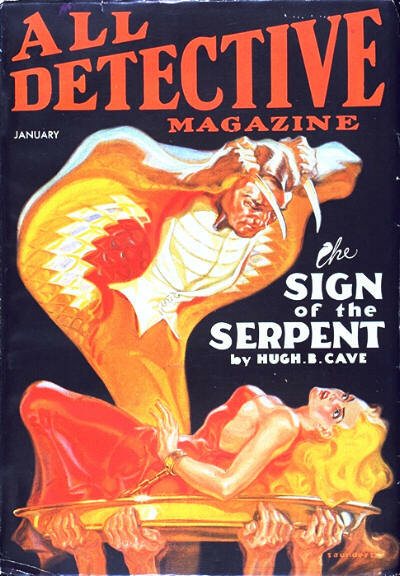 Most of the covers are rather, eh, but this one (for the last issue) is not bad. 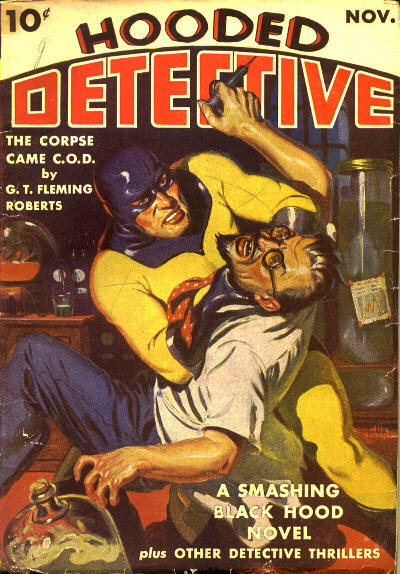 I don’t have the energy to go into all the name-changes DETECTIVE YARNS went through. There were 8 of them in the 97 issue run, including a single issue as a character pulp (BLACK HOOD) followed by two more as the slightly more mysterious HOODED DETECTIVE. This is one of the latter (11-41). He looks like the contemporaneous comic book hero, the Simon/Kirby Sandman, to me. I think this last one wandered in from some sf/fantasy rag.